While most of artists in the fourth IKEA Art Event collection have a background that includes designer toy movement contributions, the sole exception being Ludvig Löfgren. Born and raised in the southern region of Sweden nicknamed the Kingdom of Crystal, Löfgren is an accomplished glass artisan whose works frequently take the functional forms of bowls, candle holders, decanters, glasses, and vases as well as figurines and other decorative, sculptural pieces. And with his contribution to this IKEA branded series, a work entitled The Eye, Löfgren reveals his extensive experience with the medium not through sculptural complexity but rather by expressing the possibilities of crystal through subtle nuances. Already educated at Swedish art schools like Hovedskou målarskola and Konstfack, Löfgren pursued the necessary skill of his chosen medium by attending Riksglasskolan, the country’s National School of Glass. “I fell in Love with glass mostly because it’s difficult, alive, hot, and slippery, and ends up being cold, hard, and razor sharp”, Löfgren said of the material and the challenges of working in it. Receiving the title of glass master at the age of 25, Löfgren initially worked at Kosta Boda before becoming one of the five in-house designers at Målerås Glassworks, where all the IKEA Art Event 2018 figurines were handmade. 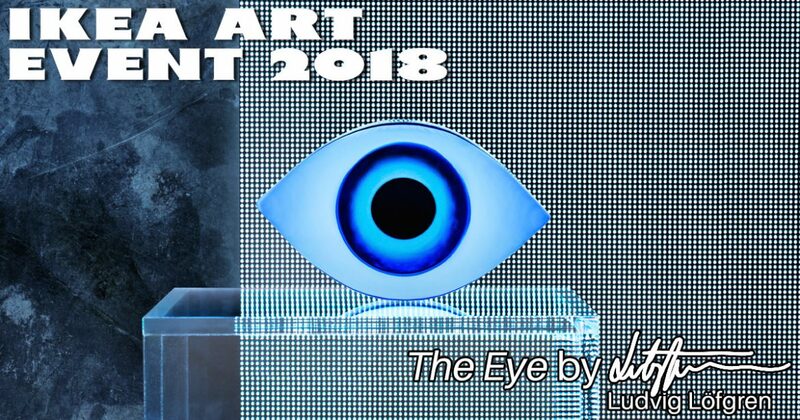 “I have always been interested in symbols and the meaning of them”, Löfgren states, explaining the inspiration behind his contribution to the IKEA Art Event 2018, a design he plainly titled The Eye. And while this can be taken to have a literal meaning on the most superficial level, Löfgren explains that the “coloring of The Eye is inspired by the old protection charms from the evil eye“, a malevolent glare that curses whoever it is directed at. And by incorporating the blue hues frequently associated with the eye-like nazar or a hamsa talismans, Löfgren has created something that not only honors a symbolic tradition but also raises an increasingly common concern in our digital age: “The Eye is about being watched and watching over”, Löfgren explains, “so both a protection against evil and something looking at you so [that] you behave”. Continue on to Post 4 of 9 in the series “IKEA Art Event 2018”.